It seems that kghawkes had trouble finding the Twisteez brand wire and subbed jewelry wire instead for the February stitchalong - I think her version looks just as lovely! It's um, looking pretty bare in the pool for this stitchalong - only 1 in progress and 1 finish! 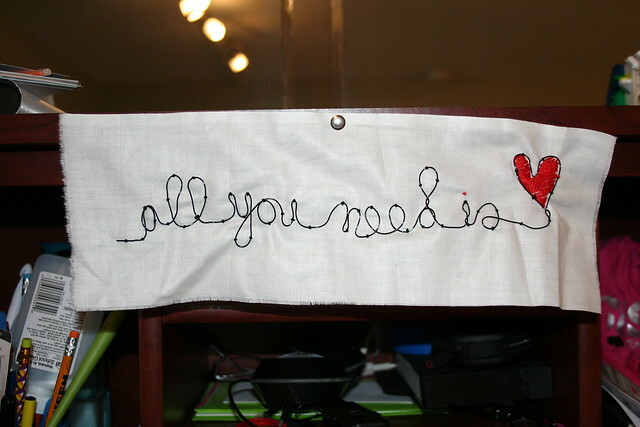 I'll be doing a final check-in post on Wednesday, so you still have time to craft your own version, tag it "feb2012stitchalong" and add it to the pool. Would the stitchalongs have to be done in the respective month? :( I've only started stitching this year and didn't think to immerse myself into the blogosphere right off the bat. Awe! I'm flattered! It's my "resolution" to do every stitchalong this year. It's a great way to learn new techniques! Katelin does beautiful work. She just stitched an anatomically correct heart on the inside pocket of her husband's clinic coat with a sweet saying for valentines day. Thank you for showing her work!